......... AND GUESS WHAT, SOME OF THE PEOPLE INVOLVED ARE ALSO INTER-CONNECTED TO THE INFAMOUS AND FRAUDULENT OPERATION OF Tu-E CAPITAL BERHAD / GIDIFA OUT OF MALAYSIA AND INDONESIA. Following my last article I have been inundated with responses, some with more information, some with actual further documentary evidence, and some with persons stating that they were involved, and knew it was all wrong, but they were acting under orders. Let me attend to the latter of the above first. To an extent such people can be forgiven, not for their acts of complicity but for the fact that they are absolutely unaware of the law (even though they shouldn‘t be) which gives them the right to refuse to undertake an official order if they consider it to be of an illegal nature, or involving illegal activities. That law is pretty much an international law applicable in most countries on this planet. How the people involved handle it obviously depends upon circumstances, one of which is that they fear for their lives and the lives of their family's, should they ever refuse. There is of course always political asylum either in its basic form, or, political asylum based upon fear resulting from the refusal to undertake an official order. Unfortunately, America is well known for its blatant unlawful activities if persons, or even countries fail to comply with what America does, or wants to do. The FEAR FACTOR is very prominent and in certain cases visible. What I would do in such a predicament, I really do not know because I have never had to face such a situation. However, the lure of money beyond one's dreams does appear, in many cases, to be the prominent factor facing the people involved in these crimes. Money is the pinnacle to the masterminds behind these crimes, and they couldn't care two cents if there is human collateral damage along the way. I would call it one sided Russian Roulette, or Heads we win, tails you lose. To those persons, and there are a very large number of them, who provided us with additional documentation, some of which is absolutely incriminating and evidence beyond all reasonable doubt, you have our thanks and gratitude. There were a small percentage of people writing to us and stating "PLEASE HELP ME". These are people who have spent their hard earned savings attempting to assist the criminals with their stories of Humanitarian causes, etc. We have tried, unsuccessfully in the past, to assist to recoup the money given to these criminals by innocent everyday people. Unfortunately, by the time we track the relevant Bank Accounts, the money is no longer there. Taken out of the accounts in small quantities in cash and then disappeared, leaving a very small or zero balance on the account that money was paid into. Some of the documented information we received was clearly marked "Top Secret", however, on the legal grounds of His Excellency's Powers and Authorities ruling supreme over all other Sovereigns or Sovereign Governments where it concerns, is related to, associated with, or otherwise, The Global Debt Facility, of which he is the Legal Heir and Owner, under International Treaties, His Excellency has utilized those powers to declassify all documents so that they can be opened and the incriminating evidence reviewed by the public. 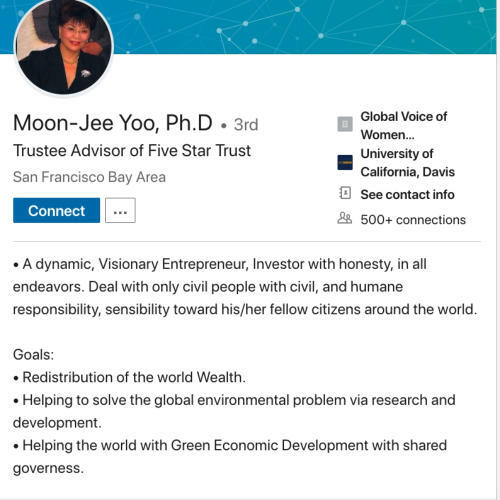 The first documents (Refer below) appear to be a very brief positional descriptions of persons connected to Five Star Trust, namely Marion Horn Jnr, Executive Trustee of Five Star Trust, and Moon-Jee Yoo, Phd, Trustee Advisor of Five Star Trust. Oh, how these people make their criminal activities appear so genuine and legal. A Trust, and persons connected, associated, related, or otherwise to that Trust are all complicit in Theft and Fraud against the Global Debt Facility, contrary to and in breach of International Law as dictated under numerous International Treaties since 1850, all of which is totally detrimental to all other countries and the people of the world. We have, a few years ago, officially notified the American Government, CIA, Federal Reserve, and many others like the World Bank, IMF; of their illegal activities, hoping that someone with COMMON SENSE and DECENCY would do something about the problem. All parties and individuals completely ignored our communications, and so the theft and fraud still goes on today, but at least they have been warned and cannot claim that they didn't know. Ignorance is no excuse in the eyes of the law, so the above parties will not receive any future communications from us. Action is now the only remedy, even then they will all be shouting as loud as they can, "WE ARE INNOCENT, or WE DIDN'T KNOW".......................... TOUGH, NOT OUR PROBLEM, YOU WERE WARNED". The next document is 24 page document for which I have made this a .pdf attachment. The above letter is very, very interesting to say the least. Please read through to the very end and, surprisingly, you will come across the names of Ernest Bey aka. H.E. HRH. Royal Prime Minister Ernest Rauthschild of the United States of North America, The Republic of North America, The Family of Nations, one person holding extreme and unjustified Illusions of Grandeur. Angel Ferdinand Marcos, aka Edilberto del Carmen aka Edilberto Marcos Marcos, Winston Shrout, Sir Ricky Nathaniel aka Chief Justice HRH. Lord Windsor, Sir Ricky Nathaniel, who is another person holding extreme and unjustified Illusions of Grandeur. Are they too insecure in their lives that they have to live in these fantasies? Possibly excluding Winston Shrout, who has just received a Ten (10) year prison sentence for fraud, all the above names are also connected to the Tu-E Capital Berhad / GIDIFA scandal in Malaysia, Indonesia, Philippines which is still an ongoing investigation in several countries in Asia and Africa. It also appears that Tu-E Capital Berhad / GIDIFA are still operating despite all the Fraud warnings issued by the Malysian Central Bank, the Thai Ministry of Foreign Affairs, the Indonesian Government, the Chad (Africa) Government, and ourselves the ITC, so there is no doubt in our minds that Government Officials, Police and Military are being paid a lot of money to turn a blind eye, and the fact that this is definitely a CIA operation. Please refer to my various articles on this subject, as published within the section David Crayford and the ITC on the abundanthope.net website. Refer MP4 Video: https://christ52.stackstorage.com/s/9lK3rNPBxbBjHiD Ernest Bey aka. H.E. HRH. Royal Prime Minister Ernest Rauthschild of the United States of North America, The Republic of North America, The Family of Nations, one person holding extreme and unjustified Illusions of Grandeur. There are several other names as well which are stated in the above document, which are now being investigated. 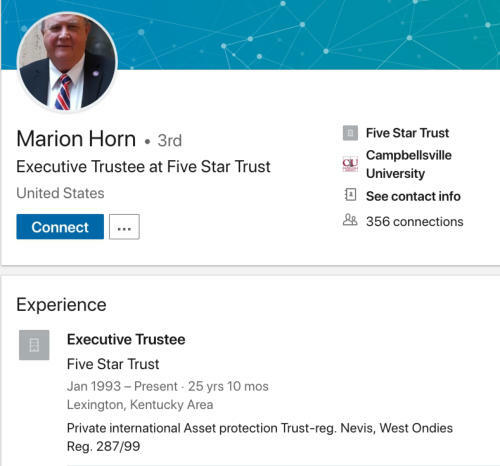 What a Bloody cheek these people have ---- Assets of Five Start Trust -----", "helping us recover assets of FIVE STAR TRUST and its beneficiaries ......................". Let me say it one more time, all Assets and Accounts stolen by these people, or on behalf of these are actually the legal property of The Global Debt Facility, as defined under numerous International Treaties dating back to 1850. Yes, Mr President we want you to assist us to undertake a heist and Rob several Banks of assets that are not actually ours but we would like to utilise those assets for humanity, our own Humanity of course, whereby we believe that as our President you have the power to demand that the said Banks pass these accounts / assets over to us without question. Oh, and in addition we might steal a couple of prestige vehicles (Bentleys preferred) along the way. How insane and bloody ridiculous can people be. Al Capone and Jesse James reincarnated, and rides again. Where's our John Wayne or Elliot Ness and The Untouchables? 2. Page 1, Para 3 .......... "I am attaching hereto a formal settlement that was done by Mr. Marion Horn Jnr through his representative General Robert L. Ferrera (US Army retired-CIA-Deceased according to US Department of Justice records, but much alive under a new name in Oslo, Norway at the CIA Safe House compound) .............. and receiving $150,000 per day .................."
Now we are getting to the nuts and bolts of what really goes on, with the CIA and US Department of Justice conspiring in the faked death of an Army General and giving that General a new name and relocating him in a European country (Which is now Switzerland, not Norway) even though that General is, and has been involved, and still involved in criminal activities against The Global Debt Facility, International Treaties, etc, all detrimental to the World, including the USA and its people. Boy, oh boy, crime does pay doesn't it and the American Government, or parts thereof, condone it and even assist the criminals to hide themselves away from Justice. Pity that the American Government, or parts thereof, cannot assist those in real need in America, and there are plenty of them, isn't it. O.K. Boys, here we go. For all those who haven't got a job and can't manage financially, so we will turn to crime because I know if we get caught the Government will give us a new name, ship us off to some far flung country and then we can live in relative luxury, with $150,000 USD per day being given to us, and we are laughing all the way. There is only one problem. None of us are a senior Military Officer, Government Official, CIA operative, NSA employee, or anyone else whom is entitled to these fringe benefits of employment, so we need to covertly get into these organisations. 3. Page 2, Para 1 .............. "It was agreed that each group, FIVE STAR TRUST, would receive One (1) Third of all future deposits or earnings of this Trust, Rothschilds family would receive One (1) Third of all future deposits or earnings of this partnership and Mr. Richard Helms, representing the CIA would receive One (1) Third of the future deposits of any and all deposits and earnings. Mr. Horn was not required to give any part of his settlement that had been agreed upon by Department of Defense and IRS, in this future partnership. Boy, oh boy, this criminal cake has another layer to it, which is just as delicious as the previous layers. 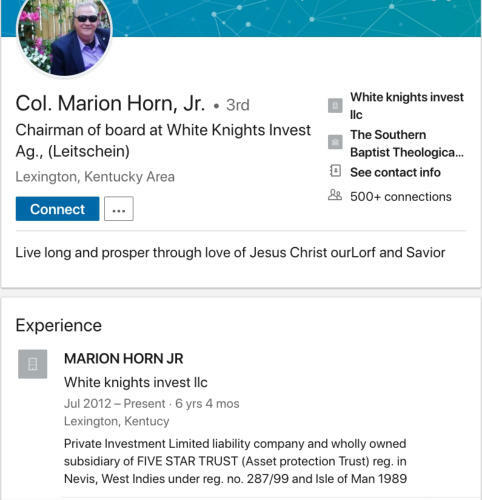 Upon the say so of the Department of Defense, and in conjunction with the IRS, from which the majority of American people can't escape from; Mr. Marion Horn, and even his family, does not have to pay any taxes of his share (Unearned / Earned income) of the take from this partnership. Hey boys, this is even more lucrative than anything any of us ever believed it could be. Crime does pay doesn't it, especially when the government, of parts thereof, are assisting you in those crimes. What qualifications do I need to be a government criminal, if any? Has America and its Government gone totally crazy? Let's use the 4i's again ............ Immature, Insecure, Irresponsible, and Insane. All of which seen very relevant and certainly applicable to America. In God we Trust, but does God trust America ........... very doubtful. 4. Page 2, Para 2 ............... "FIVE STAR TRUST for acting as the front entity and to receive any and all deposits of assets or funds from clandestine sources, secured by the CIA, and moved by the Rothschild Banking Empire ...................."
Well, that little piece of the paragraph says it all, doesn't it. Money Laundering, Wire Fraud, Fraud against The Global Debt Facility, Conspiracy to Defraud, plus evading taxes with an illegal agreement, Conspiracy to Defraud the American People, Unlawful possession and unauthorised movement of funds / assets of The Global Debt Facility, by the CIA, and based upon the involvement of the American Government, they still walk, or drive, down the local High Street with complete impunity. If you are a criminal, America is definitely the place to live and grow old, and when you die, leaving your ill-gotten gains to your family. As for the Rothschilds. They should have been hung, drawn, and quartered many years ago, and their assets / wealth confiscated. They have raped this world over and over and over again, with complete impunity, and no one has had the guts to do anything about it. America is the place to live isn't it, cough, cough, splutter, splutter. Three cheers for the 5,000 plus immigrant caravan heading for the American border, they, or most of them, want to become criminals and become wealthy, or at least have a share in all this criminal activity. Shall we join them? It's far more lucrative than our present jobs and if we get caught, the American Government will hide us away from justice, and pay us $150,000 USD per day. The above is just Four (4) sections within the first two (2) pages, and there are Twenty Four (24) pages in total. What else is going to be revealed in the next Twenty Two (22) pages. Read it all to reveal the secrets of high level crime. doubtful, very doubtful, they only tell the people what they want the people to know, and that my friends is worth 0000000000000000. We, the people, or the majority; are oblivious to the real truth because the criminals usually cover it up with claims of "False News", "Fraudulent Operations", "unknown Entities", or other fake statements. I never cease to be amazed how such criminals, as those named above, design their operations in such an elaborate and complex manner to make it all appear to be legal and genuine. In reality, these people really do have to structure their operations in an elaborate and complex manner, otherwise within the current International systems, their operations would not survive and they would probably all be in prison right now. The real problem is that they have to "Pull in" many outsiders to assist them or do the work for them, such as lawyers, bankers, former intelligence operatives, former Military operatives, the IRS, and Government departments, or similar. Do they honestly believe that everyone else are all idiots and stupid. If they do then they are the ones who are idiots and stupid, which has been shown by them several times in the last year. In reality, the more genuine and experienced one has in the subject matter, or about the subject matter, the more one can quickly identify a fraudulent operation or scam. In the real world those persons who were legally appointed and are genuinely involved with the ITC / GDF, and have been for many years, know exactly what the protocols are, what their duties and responsibilities are, what is involved, and know that the official records as referred to below can be checked at any time, so they know there is absolutely no need for such elaborate and complex structures with all the hype and propaganda because all persons involved, structures, Trust names, Trustees or Foundation Managers names, Bank Account numbers, Banks, Certificates issued, etc., are all finitely defined in official records and all legally recorded. All locked away in an unquestionable secure facility and only available to a handful of people. Non of them in any shape and form are American, or even connected to America, because they cannot be trusted, even with the dust on the floor. There is absolutely no need for people to be flying around the world misrepresenting themselves as being someone they are not, attempting to locate assets of the GDF, offering bribes to Governments and People alike, and taking people's money for financing their illegal operations. Furthermore there is no need for Western Governments, and two in particular (America and Japan), to utilise their Military and the Equipment to ship assets of the GDF to various ports of destination for further Road transport to Military Bases which have large underground depositories for the storing of this stolen Gold, Silver, Platinum, Precious Gems, etc. These above two facts alone should inform people sufficiently to understand that such actions are all fraudulent and criminal in nature, but does it. Year after year, ordinary people get caught in these scams and lose a lot of money. The next document is a 94 page document which purports to give a Resume of History and Legal Case of Five Start Trust, which I have also made as a .pdf attachment because of the size of file. This document is extremely revealing, explosively so, and contains numerous names of People, Banks, Government Departments, transactions, actions being, or have been undertaken, Top Secret documents (Now officially declassified by the ITC), Department of Defence, Diplomatic pouch transmission, etc. Page 1, Para 1 ............... "This is a brief summary of FOIA suit filed with US District Courts, which ruled in favour of President Bush and CIA. The Courts ruled that under National Security, all records related to Marion Horn Jnr, and Five Star Trust would not be released. So now we have the various District Courts involved in the "Covering up of crimes committed by Marion Horn and the US Government, and Departments of the US Government, and others, all on the basis of National Security. Bull S***, Bull S***, Bull S***, It is a cunning and devious method used by Governments to hide the real truth from the people. What is Theft and Fraud, and other criminal activities against others, by the Government, departments / agencies of Government and other individuals got to do with National Security??????? I suppose that they could be absolutely scared that the ITC will take back everything, bankrupting all those involved and America, so that America becomes another Philippines, or Cambodia, or Myanmar. Page 3, Para 2 ................. A deal was proposed by General Ferrera acting on behalf of Mr Marion Horn Jnr and Five Star Trust / US Mortgage and Trust (Bahamas) Ltd wherein a large loan was made to US Mortgage and Trust (Bahamas) Ltd. Through a newly created bank in Switzerland, named International Bank and Trust, at title of Co-Chair was given to Mr Horn, and MR Guy Rothschild. (This information was, or is on deposit with the Trust Department of Credit Suisse Bank, Zurich, Switzerland, which was the Master Account) Later, a loan was made to USMT (Bahamas) Ltd, in the amount of $750 billion USD for a period of 30 years at 2 1/3 interests paid annually in arrears. This loan was headed up by ABN AMRO BANK, Amsterdam, Netherlands, as the flagship bank, there were nine other banks involved including Citicorp, Chase, Largeswt French Banks, Largest German Bank, British Bank, and Swiss Banks, including the WORLD BANK. A formal letter was issued to the former President of Mexico, Silnas, confirming these funds. To represent the construction of a Land Bridge across Mexico. Supposedly, these funds came from the AU taken out of Russia, that is what broke the backs of Russia in the Cold War. Well, this little part certainly opens a "Can of Worms" or better still exposes the large "Pit of Snakes" to the whole world. As anyone can see, Most of the Large International Banks are involved in Theft and Fraud against The Global Debt Facility, including the notorious WORLD BANK, plus, Mr. Guy Rothschild ....... that one isn't at all surprising is it, as control of the international banking system is the Rothschilds Family forte. It also shows quite clearly that the Banking Authorities in Switzerland are deeply involved when they issue a Banking Licence (International Bank and Trust) to a bunch of high-end criminals. Then, of course there is the former President of Mexico, Silnas, apparently for a Land Bridge across Mexico ..................... I just wonder if that Land Bridge was ever build because such a major project would have been exciting and revealing National News, which would then be followed up by the International Press because of the Foreign Investment and subsequent employment generated for the Mexicans, for many years; or did all that money end up in the pockets of these criminals. The latter appears to be the most prominent option as I suspect there was no Land Bridge ever built in Mexico, and unemployment in Mexico continues to rise, as has the migration of Mexicans to America. Hey, Mexico, did you realise you had a Land Bridge built from the stolen funds from The Global Debt Facility, or, is it still a dream on a scale model displayed in a large office somewhere in Mexico or America. Then there is the last statement, quote "Supposedly, these funds came from the AU taken out of Russia, that is what broke the backs of Russia in the Cold War. You're damn right on that point, 120,000 MT of Unregistered Gold stolen (1998) under the orders of the Bush Clan through to Bill Clinton who organised everything with Boris Yeltsin. The latter of whom became a billionaire overnight, and Russia wants it all back because they are responsible for that Gold. It is also known that the majority of that Gold is stored in Austria in a tunnel, under a reservoir that goes from one large Castle to another large Castle on the opposite sides of the reservoir. Some is deposited in Montenegro, some in Slovenia, and the rest was shipped out of Port Koper, Slovenia to an unknown destination. Ask yourselves "HOW CORRUPT ARE OUR GOVERNMENTS AND BANKS?" .................................. BLOODY CORRUPT TO THE CORE, an issue that has to be attended to as soon as possible. Furthermore, if America believes it is going to introduce a Gold Backed currency at some time in the future, which it appears Donald Trump is aiming to do, think again because you haven't enough gold to do this, and A large part of that is Gold Plated Tungsten. Be assured America, you are certainly not going to be allowed to use our gold, whether you have already stolen it, in the process of stealing it, or even just thinking about stealing it. That belongs to The Global Debt Facility to be utilised correctly and professionally for the people of this world and every country in this world. America and its Allies have proven their criminality over decades, that is why they were unceremoniously removed, by The Royal Families of the World and under International Treaty, in December 1994 from ever having anything to do with The Global Debt Facility ever again following their Theft and Fraud during the years 1945 - 1995. Anyhow, you may be far too late on that issue, $500 trillion value of Precious Metals and Precious Gems has already been ear-marked (Set aside) as Collateral for a specific currency, so stop dreaming because you will be challenged right to the end of the earth, in our courts, and you won't win because we have all the official records. If you try it, every bar of gold in the world will be tested for DNA, and all at your cost America and the Rothschilds, and there will probably have to be another Gold Confiscation Act in America to recover all that has been stolen. Gee, this looks as if it is going to be one large fight. Bring it on Boys, bring it on, we are waiting and hungry for a good fight. The next document appears to be a system these crooks are using to hide transactions. It is a 6 page document that commercially describes the facilities available through the Financial Services Corporations (Note the plural use of the word Corporation) meaning not one, but more than one; together with a system referred to Worldclear which appears to be a Clearing House for International Banking Transactions. Using this system, if it really exists, would bypass the SWIFT system, the DTC system, the Euro-clear System, the MIR system, and every other known financial clearance system. In other words, everything is undertaken "In House" no questions asked, so that laundering of stolen funds or fraudulently obtained funds from the GDF, can be undertaken without reference to any other person or party until the very last minute when they use genuine and unsuspecting persons to finally launder their criminal gains into the existing financial system, and no one knows any different. Refer .pdf attachment: Financial Services Corporations (FSC) benefits for planned operations of the VIP's. 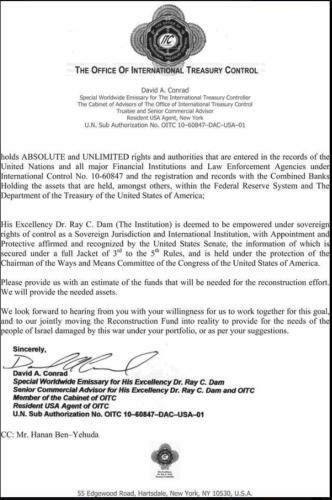 The next document is an old OITC document issued by David A. Conrad, so-called Special Worldwide Emissary for His Excellency Dr. Ray C. Dam, Senior Commercial Adviser for His Excellency Dr. Ray C. Dam and the OITC. Refer .jpg attachment: The Office of International Treasury Control, David Conrad. 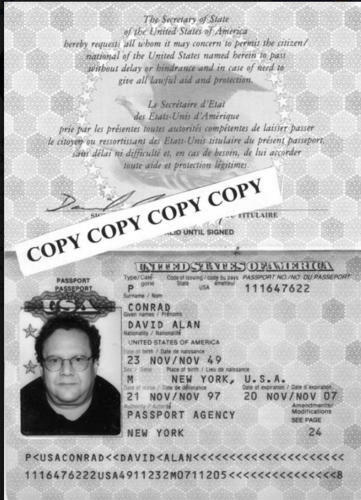 Refer .jpg attachment: Passport Copy of David A. Conrad. Refer .jpg attachment: Photgraph of Keith Francis Scott. 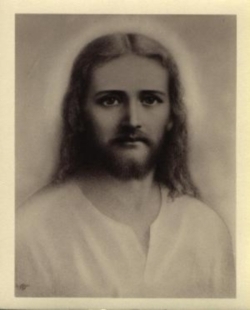 David A. Conrad is another person recruited by Keith Francis Scott and appointed under the OITC which was a commercial organisation orchestrated by Keith Francis Scott, incorporated under the fake domicile of Melchizedek, and which held no legal connection, association, or otherwise to the ITC. 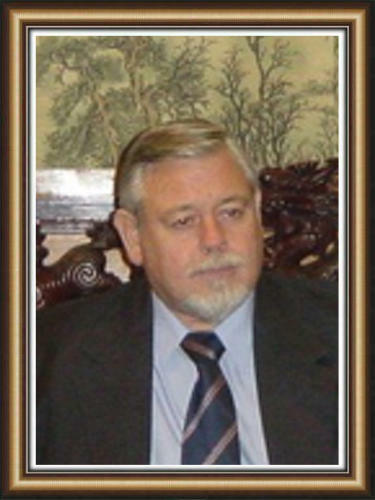 Neither David A. Conrad, nor, Winston Shrout were, or are, or have been, legally associated with His Excellency Dr. Ray C. Dam at any time and certainly, without any question whatsoever, are not and have never been associated, legally connected, or related to, or with, the ITC since November / December 2010. Both are friends and associates of Keith Francis Scott, former Special Global Envoy for Dr. Ray Dam, Executor of Dr. Ray Dam, Chief of the Cabinet of the OITC, Registered as CIA operative, Australian Field Office, Advisor to Akihiko Yamaguchi, Mitsuyoshi Watanabe, former close friend of Neil Keenan; all involved in the Chiasso, Switzerland incident in 2010, for which Yamaguchi and Watanbe received prison sentences of 3½ years each. I sincerely hope that this article, with all its attachments, together with the previous article will open people's eyes and allow them to understand why the ITC has stated that America will receive nothing from the GDF until they pay back everything they have stolen or obtained fraudulently, and that America will be forced to live in the same quality of low standard of living and poverty that they have forced others (The majority of the world) to live in for 100 +years. Furthermore, I sincerely hope that understanding this whole issue in greater depth will allow the people to understand what a difficult task the legitimate and legally appointed ITC has to accommodate and undertake in order to bring the GDF into order so that all people of the world and countries of the world, excluding those that have been blacklisted; can benefit in the expansion and development of their economies and the elimination of poverty right throughout the world. It is sickening to see and even know about the crimes being committed largely by America, but also their allies (Namely the UK. France, Germany, Japan, S. Korea, Australia, New Zealand, Switzerland) within the last 100 + years where death from disease amounting to millions of people could have been prevented, where poverty has increased dramatically as a percentage of the world's total population, which should now be at its lowest ever rate within the population, where the gap between Rich and Poor, both nationally between Sovereign States, and Independently between the population, is now so immense that massive investment into Third World and Developing Countries, and no investment into the Developed Countries, is now the only option available to bring about a more realistic balance all around the world. We thank those persons who have contributed by submitting information and documents to us, and ask for future information to keep flowing in. It might shorten my life span because of the amount of work and long hours, but it will also shorten the time needed to bring the GDF back into order and the criminals into prison, or utilised as food for the Crocodile or Sharks. There is one very important factor that I haven't covered which is, that all this additional information, names of individuals, names of Banks, etc has now prompted us to add all to our list of persons to be prosecuted in our courts under our jurisdiction. Unfortunately, the list is already extensive, with well over 3,500 names of individuals, banks, companies, governments, etc, so it will take time to prepare all the prosecution documents, have them sealed by our courts and then service of the documents on the relevant persons, banks, companies, Governments, etc, which may also end up with International Arrest Warrants being issued. More work for me and the team I have working with me, but that is not unusual, but it is tiring. Gee, boys, this is going to be a lot of fun, fun, fun. I've even got IQD Intel tonight. Dr. Shabbi believed that the Dinar could handle a $36.00+ rate and arranged an intake mechanism with Prof. Bob Killian (the infamous Admiral in Reno who retired as a Navy Nuclear Submarine Commander) at a $20.00 rate, of which the Admiral scoops up a nice percentage per Dinar harvested (Dong $10.00 & ZIM too $0.00000018). Even the Indian Tribes loaning the Admiral their sovereign land reservation will get a cut of all currency brought in, which was loaded onto US military planes and flown to China where the Elders recorded the serial numbers and burned it, wooden pallets and all. Lots of profit hungry hands, in lots of classified cookie jars. But at this stage of the game, what does it matter except to curious folks like us. Funny that a few 100T ZIM bond notes are worth more than all the IQD bills the Admiral ever took in going back 8 years. That's true also for historic bond owners who slaved away trying to locate authentic bonds and approved redemption outlets... as the ZIM's inherent value has rendered all other historic asset transactions irrelevant (all things being equal). China needs Africa, and Africa needs China. And Americans have the most open Internet control mechanism which allowed classified information to leak out going back to the first Desert Storm invasion. So the Elders attempted to get 100% of the printed currency and historic bonds off the street pre-RV. And while they located 99% of the historic bonds, they were less successful harvesting the 75 revaluing currencies needed to complete a global currency reset under a classified communications umbrella. So they needed to construct a private redemption event. Bring in Fighting Joe Dunford to design and implement such a difficult plan (he's well known for precision planning and flawless execution). It looks like they are cleaning up behind them so maybe they have actually moved the AU from Korea and Thailand. Most likely during Naval War Games just last month in the Pacific. As for the last page above, it does appear that this is related to the claimed and hypothetical Currency Reset Program that persons on the Web keep referring to. Whether it is or not we cannot clearly state at this juncture. Both the above documents were sent to me by an anonymous person who does appear to have some intelligence connections somewhere. So we now know who The Admiral is ----- aka: PROF. BOB KILLIAN former Science Advisor to Bush 41. Former Nuclear Sub Commander, and as we can all see, the name of President Bush comers up once again. 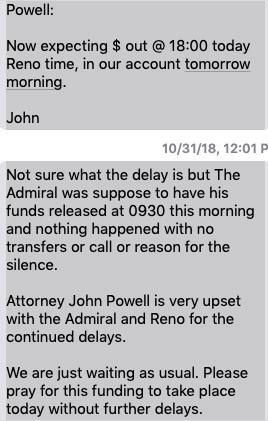 We also know that JOHN POWELL LAW OFFICES IN DENVER, of which there is limited information at this time re: John Powell Law Offices in Denver, and we also now know that John Powell Law Offices are affiliated / associated / related / connected with: BH Solicitors London. Suspension stayed means the attorney has been disciplined, but that the suspension is placed on hold (and ultimately removed) if the attorney complies with probation requirements. I will finish at this point as there is already a lot for readers to read, digest and understand.